This Wednesday, 3/14, at 6:30 pm in Crawford 169 is the fifth Cinematheque screening of the semester. 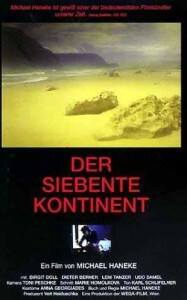 Katie Bird (Ph.D. student, film studies) will present The Seventh Continent (1989), the fifth in our ‘Anthropomorphism‘ series. Austrian director Michael Haneke trains a critical lens on postmodern alienation in this disquieting drama based on a true story. When young Eva Schober (Leni Tanzer) inexplicably feigns blindness at school, the incident brings to the surface the emotional fissure in her middle-class family’s humdrum existence. But as Eva and her parents (Dieter Berner and Birgit Doll) try to transcend their vacuous, pedestrian lives, the family slowly unravels.